2 years preparation, 1 week exhibition. Something you don’t wanna miss. If you love portraiture photography, you don’t want to miss IN MY ROOM. 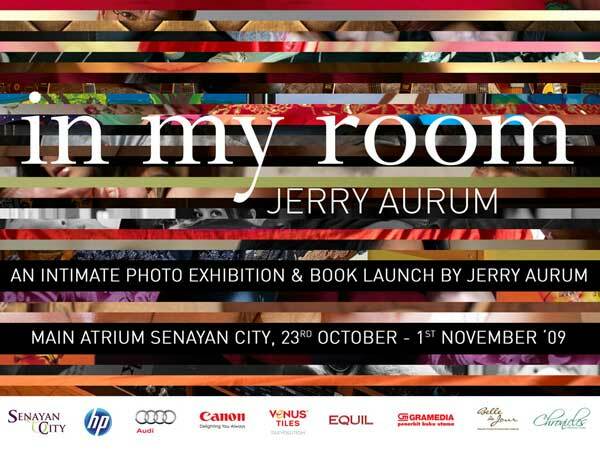 Featuring more than 100 public figures in Indonesia, the photos were taken in their most sealed domains: their own private rooms (okay, mostly the bedrooms). Come and see: Martha Tilaar, Dian Sastrowardoyo, Ade Rai, Titi DJ, Nirina Zubir, Hermawan Kertajaya, Subronto Laras, Denada, Sebastian Gunawan, Sam Bimbo, Rachel Maryam, Ghea S. Panggabean, Happy Salma, Ferry Salim, Wimar Witoelar, Ahmad Dhani, Nadine Chandrawinata, Ki Kusumo, Darwis Triadi, Davy Linggar, Ringgo Agus Rahman, Sandra Dewi, Dewi Sandra and many more! You can also buy the book at the exhibition venue. Published by Gramedia Pustaka Utama, it comes in hard-cover edition, 216 full color pages (with such good bargain price). It will be available very soon in all bookstores in Indonesia. Ouuch!! The exhibition is closed for public on Fri, Oct 23, 5-9 pm. This event is supported by: Senayan City, Hewlett Packard, Audi Indonesia, Canon, Venus Tiles, Gramedia, Equil, Belle de Jour Florist, Maverick, Thinkweb.com and Chronicles Production.